The Batman v Superman: Dawn of Justice Batman Dynamic Action Heroes 004 8ction 8-Inch Action Figure - Previews Exclusive completely recreates Batman as seen in the movie, and has 30 movable ball-joints, allowing you to make any pose you like. With highly realistic painting, this figure recreates Batman's stealthy exterior, strong physique, and detailed outfit, faithfully recreating the Dark Knight's image. The 8-inch tall action figure comes with a grenade launcher and Batarangs, which are made of die-cast metal. Also included are 3x pairs of hands and an additional right hand. 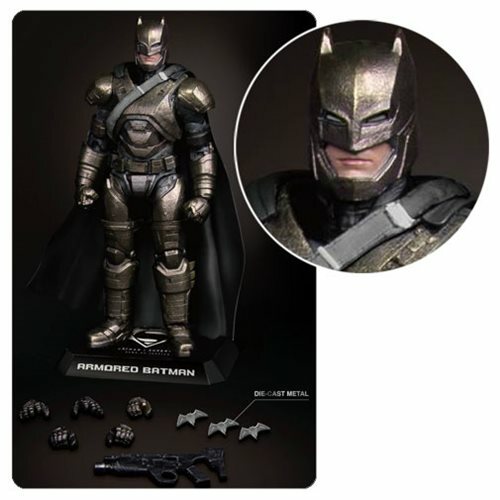 The Batman v Superman: Dawn of Justice Armored Batman DAH-004 8-Inch Action Figure - Previews Exclusive comes with a movie-branded display base. Ages 15 and up.